Stepping back into London, Golborne Road became my runway, giving me all kinds of European and North African flavours! 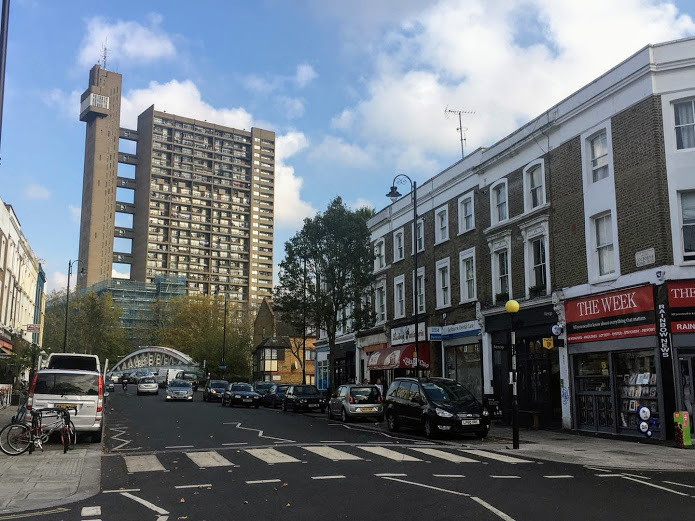 Seeing Trellick Tower being fashioned into its next phase for London City living, I had almost everything! 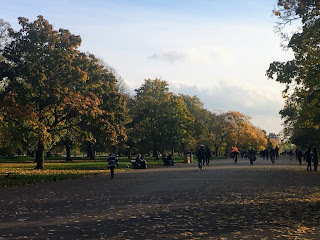 Of course Portobello Road's market made an appearance, but not before finishing things with a bit of autumnal realness at Kensington Gardens. Go! Great Portland Street Station planted me in the right part of London for my fingerprints at the Chinese Consulate, some new visa regulation called me back into London. I would be able to collect my visa on the following Monday, things were coming together at long last! Seemingly surrounded by those embassies and fluttering flags gave Portland Place some serious international flare! Westbourne Park Station had me staring the brutalist Trellick Tower in the face, I didn't feel it was right to be snapping those photos in front of Grenfell because that disaster zone is still bruised and hurting from the horrendous fires, so I decided to pay attention to its concrete cousin along Golborne Road instead. I didn't want to be one of dizzy and disrespectful individuals that saw it fit to see Grenfell Tower as a point of interest, maybe a memorial will be installed like NYC has for the late great Twin Towers? Justice for Grenfell already! Breakfast had only been a minute ago but those street food waggons had me sniffing out the talent! I had originally found a steak restaurant called 'Flat Iron' but as soon as I saw those Tagine being served outside 'Le Marrakech' Halal butchers. Ordering the lentil soup and chicken Tagine had to be done without a seconds thought, freshly made I wolfed down my delicious lentil soup with some fresh bread but where was my Tagine? Exchanging my empty soup bowl for a piping hot chicken Tagine gave me life! With the chicken falling off the bone and the potatoes cooked to perfection I enjoyed every single bite, did I need a drink? I saw the other table had fresh mint tea, I got one for myself and it was so good! Cafe Lisboa and Oporto Patisserie served independent coffee house realness with most of their patrons genuinely Portuguese, an authentic hangout for certain! I don't endorse hipster trash, throwing my first choice to the wayside I made the best choice with Moroccan food! 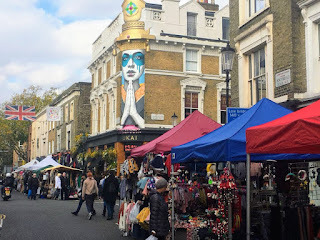 Portobello Road Market was one of the first places that I had on my London list before my visa run commenced but Thursdays only operated on half days, leaving it till the Friday I was afforded the full effect without the mayhem of the Saturday crowds! Not stressing my mind I took in the many colourful houses and shopfronts along Portobello Road Market. The food stalls were not on my radar as I had already ate some amazing food. From antiques to tourist appropriate garb I saw the lot but I wasn't bothered about making any purchases because it was all about the vibrant sights. The previous London boozers had been transformed into Thai eateries and Gin houses, something that London has done to transform itself over the last few years, I paid that attention to the Earl of Lonsdale served me a refreshing pint of Cider. I enjoyed my alcoholic drink but I noticed the amount of tourists, something that I was not! No! The market visually impressed me, was it a work of art? Maybe just so it was with its colourful offerings, London may keep on changing but this Portobello Road Market has been going strong since the 19th century with an evolution from it's early days serving fresh produce to today's antique and bohemian delights, she's legendary! Yes, Portobello Road seemed to last forever and then some, the market stalls carried on a little further as Notting Hill slowly turned into Kensington. One thing I thought was ridiculous as W10, London turned into W11, those tourists had no sense snapping group photos outside those outlandishly designed rainbow fashioned houses! During my looks of disgust at those individuals I clocked that those houses looked damn expensive! I'll never know! London is a living legend, she deserves a level of respect that is boundless, no that wasn't understood by those tourists. I didn't buy any antiques but I left with an appreciation for another one of London's markets. OK? Reinstating some calm, I made my way down to Kensington Gardens to find my favourite queen of all! Kensington Palace may have been in the background but a glorious statue of Queen Victoria stood strong, stony faced and commanding the attention, Queen Vic still has her way! With the sun almost deciding to set it was almost time for me to make my way back to the Tube for that Uxbridge bound train, I had one more thing to do though! Before doing that one last thing I appreciated the pint-sized Kensington Palace, one of London's Royal sites within a very Royal London Borough of Kensington and Chelsea, I was fulfilling fantasy because yes I'm a queen too! Oh, the air was filled with an autumnal vibe without a doubt, taking every single breath of that seemingly fresh air I took some time to enjoy that moment. I would soon be off to Beijing, China where I guess Chaoyang Park will be my equivalent? Kensington Gardens killed it! Where was Princess Diana's Fountain? I asked that question myself and consulted my Apple Maps but my battery was about to go and if truth be told I was content with what I had seen within Kensington Gardens. Admitting defeat because of the time I found Exhibition Road, running hell for leather to South Kensington Station had to be done because the Uxbridge train would take about one hour on the Piccadilly Line. Maybe the vastness of the park meant I didn't see that final part, hey oh! 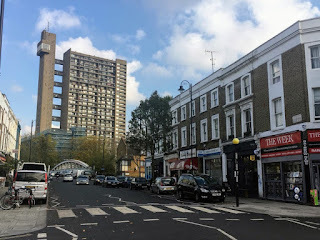 All in all my final day in London served three treats that brought the right stuff, I admired the concrete fashion of Trellick Tower in place of Grenfell because it would have been cold of me to do so. Golborne and Portobello Road Markets lived up to my expectations if truth be told, I left London feeling very accomplished yet again. London would be seeing me for one final time the following Monday for me to collect my Chinese visa, after the three month wait, it's exciting stuff! Thanks again, London!